Its’ been a while since you’ve last heard from us. That’s mainly because we have been very busy. Behind the scenes we are working on all sorts of cool things. Today we launched a very cool new feature. We call it the ‘Content Adder’. What it does? It makes adding stuff to your start.me pages a lot easier. cnn.com – Just the domain name, without protocol; saves you some typing! CNN – Just the name of the site; we actually know a lot of sites, so just try us! Simply press Enter to add the link. You will be asked to which bookmark block you would like to add the link. The Content Adder remembers your last choice, making it easy to add multiple links. 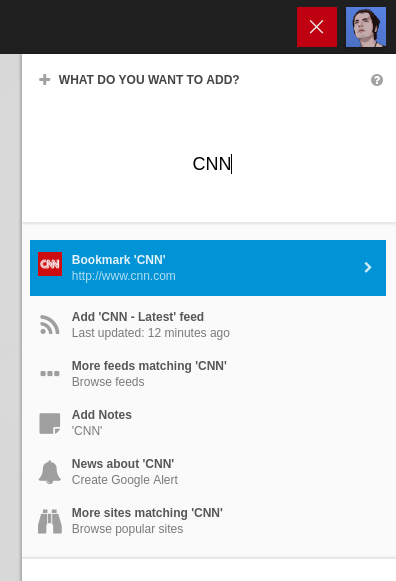 Create a Google Alert to get news about CNN. To add multiple links at once, just copy them from notepad or Excel into the Content Adder and presto! For those who prefer to use the keyboard, we have some good news as well. The Content Adder can be operated with the keyboard entirely. To open it, use the new Alt+Insert hotkey and start typing right away. Or even better: if there is something on your clipboard you want to add, simply press Ctrl+V and the Content Adder will open automatically. We often see user pages containing empty blocks. Sometimes you just forget to remove it or perhaps it is not clear how to configure a particular widget. To help, we changed the way empty widgets look. You will now always get a hint of what to do next or the option to directly remove the widget. Finally, we made some smaller changes to some parts of start.me. Just minor touch-ups to the overall look and feel and some usability improvements. We really hope you like the new Content Adder and the other improvements we’ve made. To read more about what you can do with the new Content Adder, please check our Support page about it. And of course your feedback is very welcome: support@start.me. I just started using start.me so I don’t know what life was like before Content Adder but the web page and its features are amazingly useful and easy to use. Thanks and keep it up. That’s great to hear! Thanks Joe!